While Gov. Lawrence J. Hogan Jr. is willing to work with the federal government on a land swap that would give Maryland control of Oxon Cove, a 500-acre parcel on the Potomac River in southern Prince George’s County, his administration expects county officials to take the lead in negotiating a stadium deal with Washington Redskins owner Daniel M. Snyder, according to officials who have been briefed on the still-early discussions about the project. The move reflects a recognition on the part of Hogan (R) and his staff that the Redskins have lost much of their luster under Snyder’s nearly 20-year ownership of the team and that keeping their distance from the unpopular owner is a smart move for a politician whose stock is on the rise. The state’s stance potentially reduces the likelihood that the team will end up moving from Landover, the site of their current home, FedEx Field, to the undeveloped Oxon Cove site near National Harbor, just off the Capital Beltway near the Woodrow Wilson Bridge. Prince George’s County Executive Angela D. Alsobrooks (D) has struck a neutral posture regarding Oxon Cove as a potential stadium site, saying that while the Redskins are a valued enterprise, she would not be willing to take funds from other higher priorities, such as education, public safety, health care and economic development, to keep the team from moving away. That leaves unanswered the question of who would make the site a true option for an NFL stadium. Even if Snyder funds construction of the stadium himself, Oxon Cove still would require hundreds of millions of dollars in transportation improvements. A single, one-lane road is the only way onto the site — home to a park and working farm — at present. “While it’s a very attractive site, in the shadows of the nation’s capital, it’s challenged by the lack of adequate transportation facilities to support development on the project,” said U.S. Rep. Anthony G. Brown (D), one of the officials who has spoken to Hogan about the parcel. “So it’s a tough road in front of anyone who is interested in seeing that property conveyed and then developed. It’s doable but it’s going to take … a team effort,” he said. Hogan acknowledged shortly after winning re-election in November that he had been in negotiations with then-Interior Secretary Ryan Zinke about a possible land swap that would give the federal government control of land it wants in Western Maryland, next to Civil War battlefields, in exchange for the Oxon Cove parcel, which the state would presumably make available to the Redskins at low cost. Zinke resigned at the end of 2018. 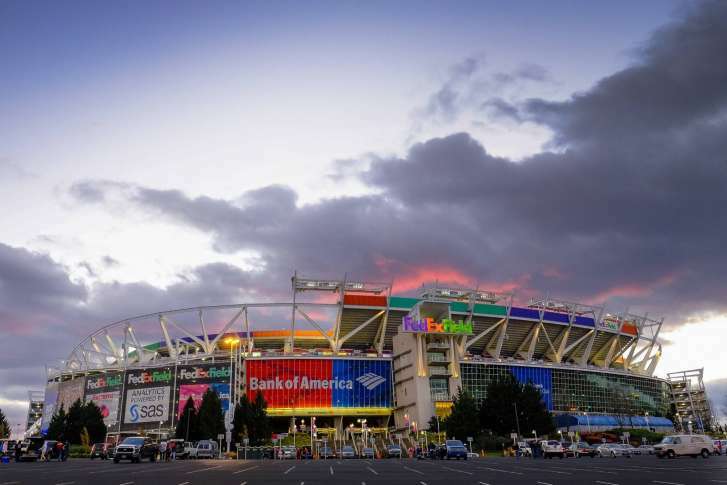 Fans soured on FedEx Field long ago, and Snyder has talked openly about building a new stadium that conjures memories of RFK Stadium in Washington, D.C., the team’s home during its glory days. He even hired an internationally acclaimed architect to work on a design. Brown said news of Hogan’s talks with the federal government stayed under wraps longer than they should have. “Many of us were caught off guard — all of us were caught off guard, quite frankly — to learn that there were discussions,” he told reporters Friday in Annapolis. “There’s nothing wrong with discussions, but as I conveyed to the governor, you would want to bring in your congressional delegation sooner rather than later before you get too far down the road, because at the end of the day, you’re going to need congressional authorization, and it’s not an easy ask,” Brown said. Hogan spokeswoman Amelia Chasse said conversations with the state’s federal delegation have taken place and will continue when the governor travels to Capitol Hill for a meeting March 1 with lawmakers. “The governor has spoken directly with Congressman Brown, and senior members of the governor’s team have conducted a briefing session with Rep. Brown and members of his staff, as well as a briefing with Senator [Benjamin L.] Cardin,” she said. Returning to the RFK site in D.C. would please many fans and would again make home games easily accessible by mass transit, though the lingering controversy surrounding the team’s name and neighborhood opposition loom as potential hurdles. When Terry McAuliffe (D) was governor of Virginia, the state made no secret of its desire to lure the team to Loudoun County, future home of Metro’s Silver Line. The club’s headquarters is in Ashburn, Va., and it holds training camp in Richmond. Current Virginia Gov. Ralph Northam (D) has not been as vocal regarding his intentions.